It’s five o’clock in the morning and our bus has just pulled up to the terminal. Dozens of cabbies run towards the large heap of groaning metal as it lurches to a stop, hoping to be lucky enough to have a tourist hire them for the day. 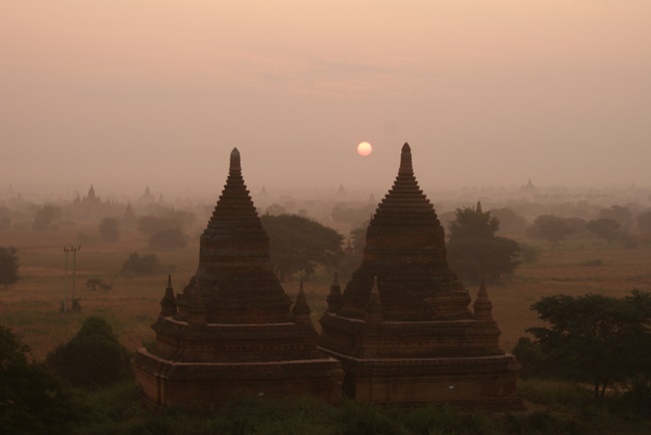 Watching the sunrise over ancient temples is Bagan’s biggest draw card. Photo by Mark Knowles. 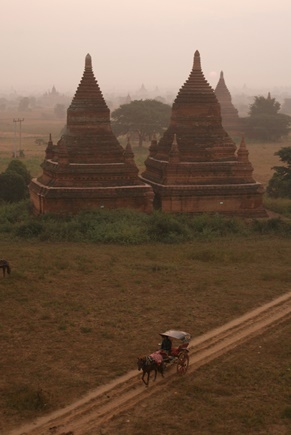 Watching the sunrise over ancient temples is Bagan’s biggest drawcard. Photo by Mark Knowles. The local vendors are friendly and welcoming. Photo by Mark Knowles. 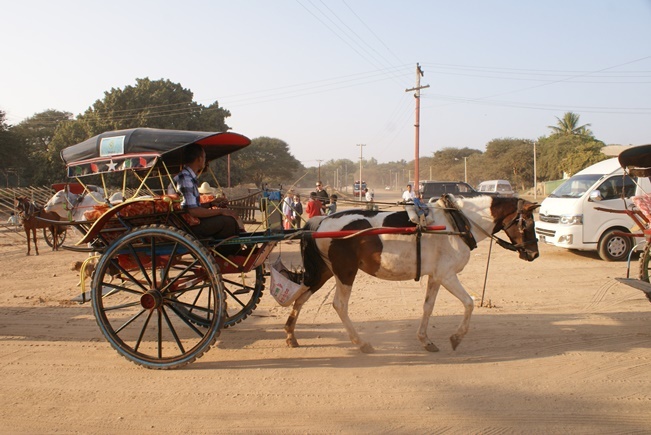 Horse and buggy are still a common means of transport in Bagan. Photo by Mark Knowles. 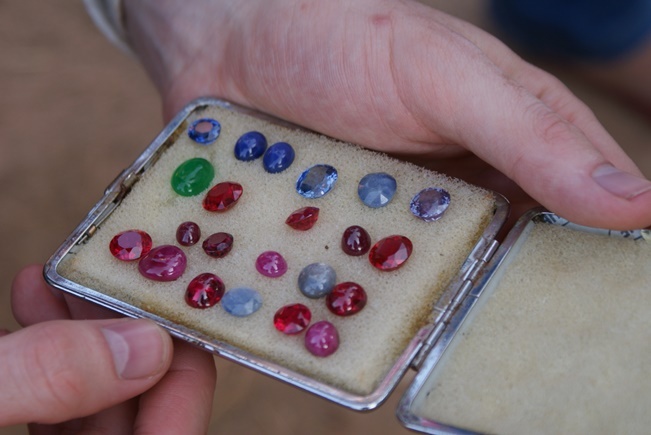 Hawkers offer Myanmar’s famed gemstones for sale. Photo by Mark Knowles. They are all heading the same way, along a dusty road towards a crumbling, earthen-coloured temple where we will glimpse the sunrise as it slowly illuminates the serene and piercingly beautiful landscape of Bagan, the city of temples. This is where I met my cab driver U Maung, a short man with a big smile showing stained teeth, well-worn by years of chewing paan – a type of chewing tobacco, usually mixed with betel nut and other ingredients, which is ubiquitous throughout country. Together, we head over to one of the main temples to check out the sunrise and as our taxi ambles along, tourists pass us on their electric motorbikes waving, clearly they’ve already been here a few days. It takes about five minutes to scramble up Shwenshandaw Pagoda, and its not exactly easy going in the morning darkness. This activity is not for the faint-hearted, as scrapes and scratches can easily happen if you’re not careful going up and one slip means a rough tumble down the ancient, cracked and sometimes jagged stones. Once I reached the top the view was breathtaking, and soon the lengthy ten-hour bus ride from Yangon, where I sat next to a teenaged boy pumping death metal through his headphones at full blast, fades from my memory. My new “friends” from the bus trip are already at the top, and they want nothing more than to admire the view with a friendly stranger, though they seem to prefer seeing it filtered through a smartphone. 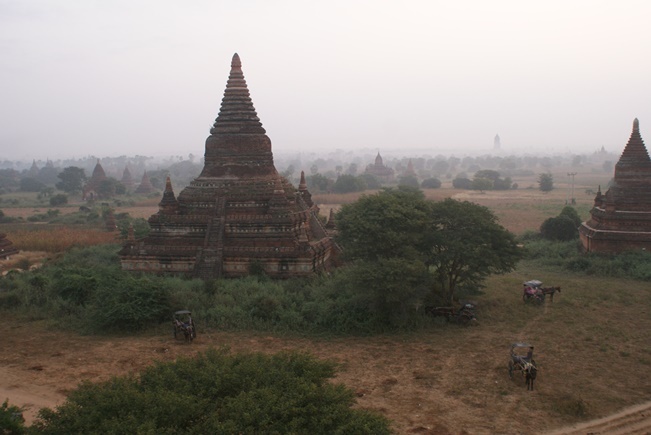 Slowly, the sun creeps up, pulling away the blanket of darkness that was hiding the mosaic of time-worn pagodas and stupas that make up about 90 per cent of Bagan. Even the colours of the sky look older than they did before, as the magic of the city transports you to a time before modern borders were drawn. After an hour atop the pagoda, U Maung and I spent the day heading from temple to temple, stupa to stupa, climbing, and ducking under massive, perfectly-cut stones. It wasn’t until midday that I found my new obsession: tamarind flakes. These little drops of heaven are sweet, small and simply melt on the tongue, the perfect snack for temple-hopping. 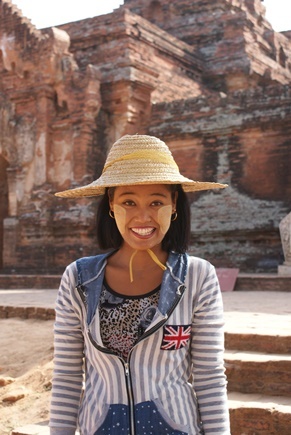 Though the tourism industry in Myanmar is growing rapidly, Bagan has a fair way to go before it will see the hordes of tourists that Angkor Wat or even Ayutthaya regularly attract. Hawkers selling clothes, gemstones and Buddhist figurines are seemingly at every attraction, but with over 2,200 pagodas and temples, many of them still seem abandoned to the landscape. The temples were built over a long period of time, the oldest being just over 1,000 years old. Most of the attractions are Buddhist in nature, but many have Hindu influences and even animist features. One day in Bagan is probably enough for most people, but the quaint locally-run guest houses are very accommodating and friendly, so if you decide to spend a extra few days there it will be a very laid back experience. Local laws aimed at preserving the city only allow tourists to hire electric motorbikes if they wish to get around independently. Horse and buggy taxis are very common as well, which makes the city all the more peaceful.